As a result of successful legislative efforts by our client, Colorado Coalition of Land Trusts, the Colorado Conservation Easement Tax Credit program has been expanded. Starting in 2014, there are $45 million in Colorado conservation easement income tax credits available each year, on a first-come, first-served basis. The tax credit is equal to 50 percent of the donated value of a conservation easement, with a cap of $375,000 per conservation easement per year. The program has been radically revamped due to 2013 legislation, S.B.13-221. 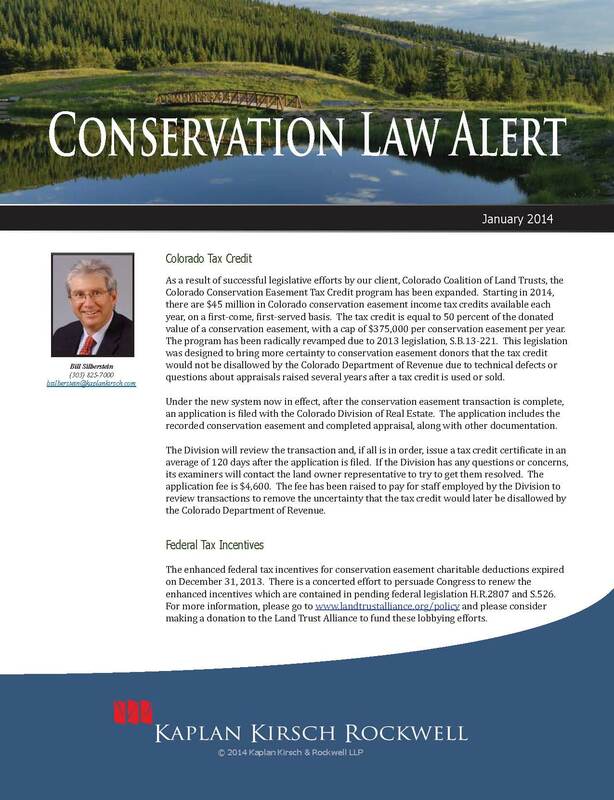 This legislation was designed to bring more certainty to conservation easement donors that the tax credit would not be disallowed by the Colorado Department of Revenue due to technical defects or questions about appraisals raised several years after a tax credit is used or sold. Under the new system now in effect, after the conservation easement transaction is complete, an application is filed with the Colorado Division of Real Estate. The application includes the recorded conservation easement and completed appraisal, along with other documentation. The Division will review the transaction and, if all is in order, issue a tax credit certificate in an average of 120 days after the application is filed. If the Division has any questions or concerns, its examiners will contact the land owner representative to try to get them resolved. The application fee is $4,600. The fee has been raised to pay for staff employed by the Division to review transactions to remove the uncertainty that the tax credit would later be disallowed by the Colorado Department of Revenue. The enhanced federal tax incentives for conservation easement charitable deductions expired on December 31, 2013. There is a concerted effort to persuade Congress to renew the enhanced incentives which are contained in pending federal legislation H.R.2807 and S.526. For more information, please visit the Land Trust Alliance's website, and please consider making a donation to the Land Trust Alliance to fund these lobbying efforts. In addition, you may contact your Representatives and Senators to personally persuade them to enact this legislation. The enhanced incentives were enacted by Congress in 2006 and have been extended by Congress annually, although in recent years Congress has allowed them to expire at the end of a year and renewed them retroactively the following year as part of a tax extenders bill. deduction from a conservation easement donation to offset up to 30% of adjusted gross income in the year of the gift and to carry forward and deduct any unused portion of the donation for an additional five years. Under the expired rules, donors were entitled to use the conservation easement donation deduction against 50% of their adjusted gross income (100% for farmers, ranchers and forest landowners) and to carry forward any unused portion for up to 15 years. We hope that Congress acts soon to renew the enhanced incentive. However, over the years we have observed that, with the exception of farmers and ranchers who qualify for the 100% deduction, the old rules are often incentive enough for our clients to complete their conservation easement transactions. Our firm has been working with conservation organizations and landowners on a variety of stewardship matters. These include assignments of conservation easements from one conservation easement organization to another, and amendment of conservation easements. Bill Silberstein will be presenting on conservation easement amendments at the Fourth Symposium on Advanced Legal Topics in Land Conservation in Reno, Nevada, on February 5-6, 2014. A PDF of this Conservation Law Alert is available.